As a trainer and teacher-trainer working in driver education, I am always looking for new ways to develop my skills. I first discovered Neuro Linguistic Programming NLP way back in 1994 and was immediately curious about its potential for use in driver training and development. 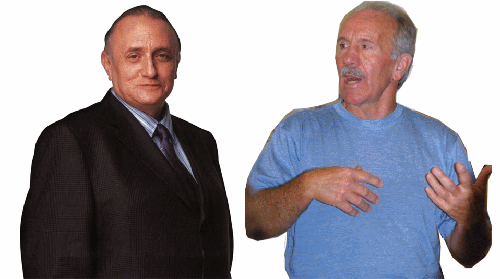 NLP was created and developed by two highly innovative Americans, Dr. Richard Bandler & Dr. John Grinder (shown on the right) at the University of California in the early 70's. Bandler and Grinder uncovered a special way to observe people who are experts in their field; as a result, they determined that the thought patterns and behaviour that lead to that expertise could be learned, replicated and taught to others. This method of studying people is called 'modelling' - literally learning to use someone else's way of thinking as a model for your own thinking. NLP is used in many areas of training, business management and therapy throughout the world. Effective 'mode ling' in driving and driver training can help us to think like the experts and develop their skills in both ourselves and others. It can also help us to understand driver behaviour. One of the underlying principles of NLP is: 'If one person can do it, anyone can'. Projects over the years have developed a range of strategies for developing specific skills and 'fixing problems' by modelling the way that some people were able to 'fix themselves'. An example of NLP modelling can be found in the Disney Strategy. This well documented project modelled the way that Walt Disney thought when creating his films; as a result, there is a model that can help people to approach and solve problems using the same creative process as Walt. Using the Disney strategy won't make you a clone of Walt Disney - but it will help you to experience the world differently, to gain an insight into the way that Walt saw, heard and felt the world he lived in and the people he worked with. By considering how mind, body and language affect our behaviour, NLP developers have designed strategies that include methods to cure phobias, develop spelling skills, improve self-esteem and much more besides. On these pages I consider a few 'tricks' that we might use NLP in driver development. Use the links on the blue menu bar above to browse the NLP pages. 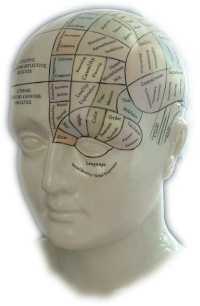 NLP is used in many areas of training, business management and therapy throughout the world. If someone says, "I can't drive on motorways", an NLP trained instructor might start by asking the simple question, "What's stopping you?" or "How do you know?" A typical response might be: "I feel anxious and disorientated." What might be happening to people like this is that when thinking about driving on a motorway, they get an overwhelming sensation of actually being there, seeing cars rushing past in their mind's eye, hearing the noise of engines and tyres, and feeling out of control. The experience might not be fully present in their conscious mind, but the feelings that go with it are. There is a clue in the language used to answer the question 'I Feel' is in the present tense suggesting that the anxiety is current in that moment at some level. Their internal mental experience might be represented in full colour with Dolby surround sound as if they were actually inside a scary movie. This mental image may be accompanied by out of control 'roller-coaster' like sensations to match the action! The resulting anxiety can block their senses and frustrate the attempts of those who try to assist them. By using an NLP technique called 'dissociation', the effect of negative feelings can be reduced, making the task of helping much easier. When dissociated, people experience their thoughts and feelings differently. There are many ways of doing this. An easy way to help people to dissociate is to ask the person to imagine the situation as if watching him/herself in a black and white on a small TV screen. That is, looking at the situation as if it were happening to someone else; this helps to reduce the intensity of negative feelings. Dissociation was discovered by using the 'mode ling' process to uncover the strategies of people who are easily able to deal with negative thoughts. Think about something that is highly pleasurable and immerse yourself in the experience. And notice how you can sense the positive emotion that accompanies the situation. Now 'step out of it'. Run your memory as if watching yourself on a small TV screen in black and white, as if that memory isn't yours but someone else's. I don't know what you will experience, however I do not that the intensity of the experience and its associated feelings will be different. The results might not be what you want for good memories... As soon as you are aware of the difference you might want to pop back into the real thing and give yourself a five minute holiday! When you are now easily able to use this technique, try it on a minor memory that bothers you. Choose something that is a 'niggle' - perhaps a tiff with someone, or a feeling of anger with a driver who cut you up last week and which still lingers. Step into the memory reliving the experience and then notice how you can reduce the intensity of the associated feelings when you dissociate. We all have the potential for feeling angry when another road user behaves stupidly or drives dangerously. As there are a lot of 'idiots' out there this means a lot of potential for bad feelings. And have you ever noticed how all the idiots seem to come out together on the days when you are late for something? All the lights are red as well! But what's really strange is that most (all?) of them stay home on the days that you are early! Feeling bad about others affects concentration and safety. The way that we respond when another driver cuts us up, drives too close behind or upsets us in some other way, almost certainly has its roots in previous experiences that we have had or people we have known; this causes our subconscious mind to give the order: "Feel Angry Now!" Our feelings take over automatically and we find ourselves responding in ways that we would normally regard as stupid or dangerous - many drivers suffer from a 'red mist' which clouds rational judgement. We might even feel guilty afterwards giving us a double whammy - wham when you feel angry and possibly lose your temper and wham again when the guilt hits! NLP offers a number of quick techniques that can help you gain control of your feelings so that you can think clearly and act rationally. In NLP having this control is called being in a resourceful state of mind. And even better - you can use the techniques in any situation, not just on the road! Make up, and believe, a story about the other driver - Perhaps he is rushing to his dying mother's bedside, or has simply made a mistake similar to those that you sometimes make yourself (you can choose to believe anything you want to). While you are only imagining these things, they are no less real to your brain. The same brain that gets frightened when you have a nightmare because it believes that the situation is real! The point is, your emotions will be generated automatically by your thoughts - You are in control of what you choose to think - think useful stuff and your brain will do the rest. Although the ideas above might sound a little silly to some people, I have used them myself and also with student drivers who become easily frustrated or angry with other motorists - and gained great results. The other thing about this is that if you practise responding differently it will become automatic - a useful habit that will ease some of the stress in your life. Using simple ideas to break the cycle of frustration and anger will help to prevent full blown road rage. Take a look at the exercise below learn to relax about tailgaters. Who's driving the car behind? By changing your mental image of the person behind you will change the way you feel... 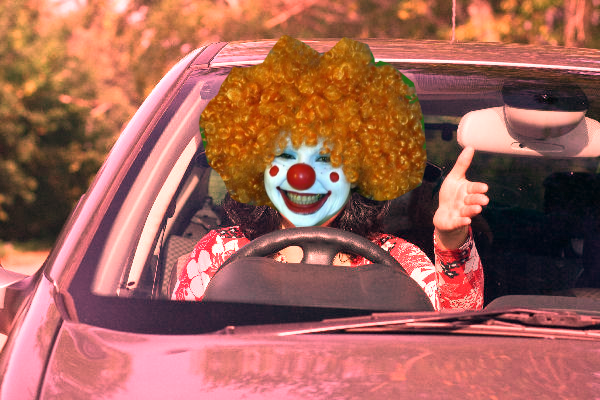 It doesn't matter how you do it - I often image a clown behind, or that the car behind is a bright pink Barbie Car. By thinking differently about the 'idiots' on the road, angry or upset drivers can gain the capability of controlling their feelings (see info below) . It is difficult, if not impossible, to hold two conflicting ideas at once. When we are thinking of the other driver in a humorous way, the humour will usually diffuse feelings of anger leaving us in a more useful state - free to make a more rational choice about our response. A person who 'can't stand idiots on the road' will have nothing to be mad about when given a mental choice of humour - safe drivers don't get mad. The NLP principle underlying the above is, 'If you keep doing what you've always done, you'll keep getting what you've always got' - if you have a tendency to get annoyed with other drivers, doing what you've always done will result in reduced in safety - the way you feel will influence the way you drive. Thinking differently enables a more useful and safer response (next page). Incidentally if you want to think differently about those who drive too close, see our tailgating info for some really useful information about dealing with tailgaters, and finding out just who they are and what they are thinking. One of the things that has emerged from NLP is that people have different levels of thinking (shown in bold type below). The higher levels control those beneath them. Taking the example of someone who becomes angry because of the way some 'idiot' has behaved on the road or anywhere else, the anger could be thought of as being at one level of thinking or response. This anger may then manifest itself as dangerous driving behaviour. To help people to 'move on' you need to tackle the problem on a different level - to help them to think differently. Trying to tackle the anger directly, perhaps by saying something like "Don't be angry" usually won't work - sometimes it will make things worse! This is because you are trying to solve the problem on the same level of thinking that it occurs; an effective cure will need to tackle a higher level of thinking. In NLP the trainer might ask the angry person the question, "What is important to you about feeling angry?" The effect of this would be to shift the person up to the next level of thinking. The angry person might reply, "I can't stand idiots on the road". This is a statement about the person's capability to be tolerant of shortcomings in others. If the trainer then questions with the same approach: "And what is important to you about not being able to stand idiots on the road?" The person might reply, "People should learn to drive properly". This is a statement about a belief the angry person has about other drivers. If the question is asked again "What is important to you about the fact that people should learn to drive properly?" The reply could be something like, "So that they can be safe drivers like me". This is a statement concerning the self-identity of the angry person who believes that he/she is a safe driver. You may already have noticed the contradiction in these statements. At the lowest level we have a person whose behaviour is 'driving angrily', while at the top level we have a person whose self-identity is one of 'safe driver'. The simple interventions described above could help the angry driver to recognise his/her own process and pave the way for change. The fixes suggested above are quick and simple ways of tackling a problem; they work very well in some cases and have been used here to demonstrate the principles involved. 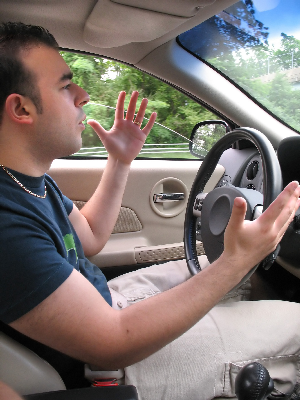 However, if a driver believes that getting angry doesn't affect his/her ability to drive safely, then other methods may be needed to change the situation. Inevitably, some people may need retraining or a course in anger management to resolve their problems. Hopefully, these pages have offered you an idea of how NLP might be useful to help drivers to think again about some of their habits - having said that, it draws on only a small part of the field NLP as a whole. If you would like to find out more there is lots of stuff on the internet or at your local bookstore.